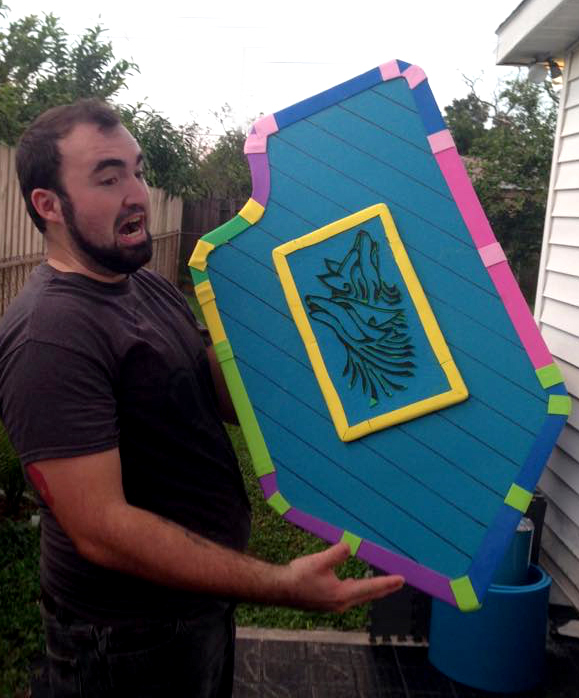 * Not all shields are as pretty as this. When a new member or a WalkOn participant wants to try our sport we will loan one of the group weapons to them. Often, new players are encouraged to gain experience with a single sword and shield combo. This helps the new player gain skills with an effective and safe weapon set that reduces injury to others and ensures the safety of the entire group. Vargar Company has a wide array or Group or “Loaner” weapons. New members are encouraged to build a personal set as soon as practical but until then, all members and walkon participants can choose from our selection. As new players progress they are encouraged to pick up other types of weapons. Our pool of loaner weapons runs the entire spectrum of melee weaponry. Daggers/knives, short/long swords, Axes, Maces, Hammers, Two Handed swords, Short/long spears, Glaives, and some of our prototype weapons. Returning members are always encouraged to attend one of our regular build days. Although, our loaner pool is available to help advance their experience and skills. Many players find it more fun and helpful to try out weapons without first committing to building or purchasing them.